The Series F Muncher is a heavy duty grinder, ideal for bulk reduction, material reclamation and profit from waste. The operating principle is based on independent drive shafts offering greater torque and variable particle size is determined by the cutter/spacer arrangement. 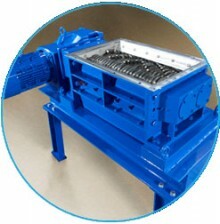 The unit can be supplied with a feed hopper or delivery chute to assist material entry and discharge. For improved processes at Bio Gas plants, the Series F Muncher has been successful in the maceration and reduction of organic waste to a small particle size, to offer a more homogeneous mixture. By introducing this homogeneous waste to digesters, gas production is increased, which is a benefit for combined heat and power systems. The need for costly disposal is also eliminated.